Or view larger version. Photograph of an Indian woman sitting weaving a burden basket. ca. 1900. A. W. Ericson, Photographer. Photograph. Collection of Oakland Museum of California. Gift of A. W. Ericson. 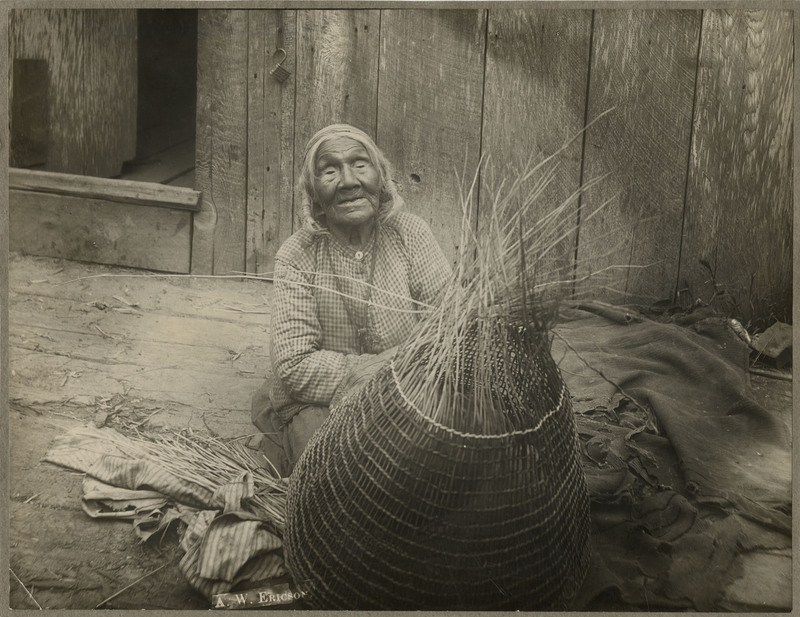 This is a photograph of a Hupa Indian woman weaving a burden basket. Weaving a basket was very time consuming. The process began with gathering the materials, which was done nearly year round. A variety of plant materials were used to weave baskets, including, hazelnut sticks, straw grass, conifer roots from different types of trees, maidenhair fern, and white alder bark. The weaving was always done in a clockwise direction and the materials were always kept damp while the Hupa women weaved the material. To add color and design to the baskets, different color rods were woven into the basket. Some of the different color rods were collected, while others were dyed using natural dyes.